In reference to last week’s blog on self-publishing, any self-employed business owner knows that you play many roles and all of them require your time, to one degree or another—which is why I am taking a hiatus from blogging. To do what? 1) New Website: While my current site has served me well, and has been a good learning experience, it is time to design an effective brand strategy that will give me an edge in the increasingly competitive literary market. Before I do so, a special thank-you to Lindsay Polyak, who has helped me in many endeavors throughout the past two years. She designed and maintained my website, uploaded my blogs, kept my social media sites current, and carried out various advertising and marketing programs for me. She is a busy woman: wife, mother of a three-year-old, full-time marketing director for a CPA firm, and owner of Lindsay Polyak Photography. 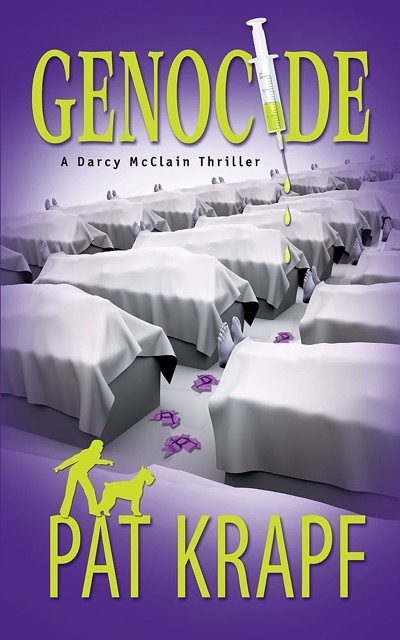 2) New Book: In the fall I will release Genocide, book three in the Darcy McClain and Bullet thriller series. The cover has been completed, thanks to Fiona Raven of Fiona Raven Book Design. And the manuscript has been edited many times, beginning with Linda McKinley, fellow writer and friend, and subsequently professional editors Caroline Kaiser, Arlene Prunkl, and Leslie Lutz, and will be proofread by Zetta Brown. 3) Marketing Plan: This year I will also launch an aggressive marketing plan for the series, which is certain to demand a good deal of my time, but I am looking forward to the challenge. 4) Clonx. While juggling the first three tasks, I’m sure I will squeeze in time for another adventure with Darcy and Bullet as they track down Cate Lord’s killer in book four in the series—Clonx. This entry was posted in Writing and tagged Arlene Prunkl, Author Pat Krapf, Caroline Kaiser, Fiona Raven, Leslie Lutz, Lindsay Polyak Photography, Lindsay Polyak website designer, Pat Krapf, Pat Krapf Texas fiction author, Techno-thriller, Techno-thriller author Pat Krapf, Texas Author Pat Krapf, website, Zetta Brown on January 14, 2016 by Pat Krapf. Why Did You Self-Publish Your Thriller Series? Time was my primary reason for self-publishing the Darcy McClain Thriller Series. When I began writing thrillers, I focused on doing just that—writing. Many years later, and after countless revisions, I had four novels I felt were ready for submission to literary agents. But for one reason or another—and many times no reason was given—the books were rejected. My reaction to these rejections? Disappointing, but they only reinforced my commitment to write the next book in the series. Blind Revenge and Genocide were rejected because of their length, and justifiably so. However, back then, as a novice writer, I was in a quandary as to how to cut the word count, so I enrolled in a self-editing class—one of the best investments of my writing career. Our professor, Don Whittington, made it a course requirement to attend one meeting of the Dallas/Fort Worth Writers’ Workshop, a read and critique group. I was a member for ten years, and the knowledge and direction gained was invaluable. Of the book rejections I received, one stands out as the most constructive, and it steered me in the right direction. The handwritten note came from literary agent Elizabeth Pomada of Larsen Pomada Literary Agents in San Francisco. “Dear Pat—Thanks very much for sharing Genocide with me. The idea is intriguing, but more pacing and pruning would help. Keep at it.” After Ms. Pomada’s comment, I enrolled in Don’s class. As for Gadgets, one agent wrote, “You write well . . . no question about it, but this isn’t what I am looking for right now.” Regarding Brainwash, the general consensus was that agents didn’t like me “sticking my toe into sci-fi” when the book was labeled a thriller. Undeterred, I kept honing my craft and I pressed on with my writing, occasionally taking time for submissions, but my main focus was working on the next book in the series. Bottom line, I was hooked on Darcy. In 2001, Gadgets won the Betty L. Henrichs Award for Best Publishable Mystery Novel, bolstering my confidence in my writing skills. In 2004, Brainwash failed to make the cut but didn’t miss the mark by much, and the critique proved helpful. In my estimation, the deficiencies cited were minor because they could be easily fixed. For example, an argument between Darcy and Charlene took center stage at the beginning of the book but fizzled toward the end with no solid resolution. I never intended for there to be a resolution. After all, how do you resolve a lifetime rift in one book? However, I did tone down the conflict, and the long-standing divide between the two sisters will explode in a heated argument in Clonx and a decisive resolution will occur, as I had originally intended. The judges also wanted to see, hear, and smell more of the New Mexico landscape. From reader reviews, I’ve gathered that this has been corrected as well. Many readers have commented that they felt as though they had been to New Mexico even though they have never set foot in the state. Others who knew the area said I captured its essence, and my love for New Mexico was apparent. As the years passed and I wrote one thriller after another, still more consumed with writing than pursuing publication, I realized the time had come to do something with the seven Darcy McClain novels I had, and the two others that were firmly planted in my mind. I toyed with the idea of, once again, going the traditional route but weighed the time involved. At lunch one day with several fellow writers, I listened to someone say they had waited months for a reply to their query, while another had waited almost sixteen months for a response regarding her manuscript submission. Another said his novel had sat on a desk for over two years, and when pressed, the literary agent finally admitted the box containing the manuscript had never even been opened—and the agent had personally requested to read the book. None of this was news to me, for I had been through similar experiences. For weeks, I mulled over the time issue and finally made the decision to self-publish. I came to this conclusion by weighing the following considerations: Publishing is a subjective business with agent and publisher wants/needs always changing, which makes predicting what they want, need, or find marketable at any point in time an impossibility. Besides, my goal was to write what interested me and not to write simply for commercial appeal. Publishing is also a slow industry. It takes weeks, sometimes longer, to get a response to a query letter, and months to read a three hundred- to four hundred-page manuscript. I waited over a year to hear about Brainwash. When I did, the response was encouraging: “You write well and you have a compelling concept for a thriller.” However, the editor did not like my crossover from the thriller genre to science fiction, even though the step was, in my opinion, minor. She agreed to “take on the book” if I deleted any sci-fi references. I pondered this request for over a week and relented, only to learn that she no longer worked for the publishing house and was “pursuing other interests.” Around this time I began to ponder why any writer needed to look to the publishing industry for validation. Why not self-publish and let readers determine the outcome of your series? Either it sold or it languished on Amazon. And as far as promoting the series, with a degree in advertising and post-grad work in marketing, I stood a fighting chance of seeing the series sell, and sell well. Would it take a lot of work to self-publish and to promote the books? You bet. But how rewarding to promote your own creation. And another upside to self-publishing? You have control. You can’t control someone else’s time, but the more you are in charge, the more you can control. Someone once asked me, “Why does it take so long for you to write your next book?” First of all, writing is not a footrace, which is another plus to self-publishing: working to your own deadlines and not those mandated by a contract. And my goal is to produce quality, not quantity. I have no interest in adding to the glut of poor-quality books already in the marketplace any more than I wish to surpass my fellow writers in the number of books they have on Amazon, or any other book outlet. Producing a quality book from cover to cover is what I am striving to do with the series. I recently read an interesting article titled “Dear Self-Published Author: Do NOT Write Four Books a Year” by Lorraine Devon Wilke and thought you might enjoy reading it as well. This entry was posted in Writing and tagged Author Pat Krapf, Darcy McClain, Darcy McClain series, Darcy McClain Thriller, Darcy McClain Thriller Series, Pat Krapf Author, Pat Krapf book, Pat Krapf Texas fiction author, Techno-thriller, Techno-thriller author Pat Krapf on January 7, 2016 by Pat Krapf. 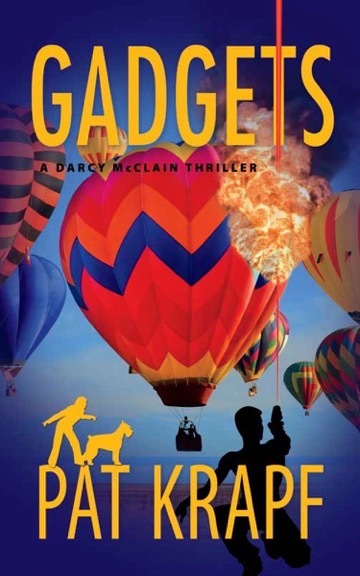 Darcy McClain is a former FBI agent-turned-private investigator. Although her former position with the FBI plays a minor role in my thriller series, I still researched the subject in detail. I started at the library, poring over nonfiction material. Then I conducted research on the FBI’s website. I was also fortunate to interview several agents at writers’ conferences. There is an FBI agent named Jack in Clonx, and I will definitely contact the FBI field office in Dallas to learn more about how local agents work as I flesh out Jack’s character. As for private detectives, Darcy is licensed in the state of California. Years ago, prior to writing my thriller series, I attended several courses at the Screen Actors Guild in Los Angeles, along with a friend who happened to be a retired LAPD detective. He gave me some unique insights into the daily lives of officers and detectives that work street crime. I’ve used his information as a foundation for Darcy’s experiences. Nothing compensates for writing about a giant schnauzer like owning one, but I do not advocate buying or adopting a giant unless you have owned one before or if you are well educated on the breed. Please do your homework prior to even considering a giant schnauzer. I’ve been asked to “include more of the dog” in my series. I intend to do just that. In Clonx, Bullet plays a major role as a scent detection dog. How will I do my nose work research? I’ll begin with online sites and books dedicated to the subject, and then I will attend nose work classes. In addition, I plan to consult with fellow giant schnauzer owners who are active in the nose work field, as well as confer with a friend whose lifework has been search and rescue. The greatest reward that comes from all of this research is knowledge, on so many subjects. I was once asked what I disliked the most about research. I don’t like researching topics such as child abuse. It ruins my day and drags me down emotionally, but I stuck with it, doing so in small doses, until I felt I had an understanding of Paco’s hatred toward his abusers and his need for revenge. After several self-edits of Gadgets, I gave the book to a fellow writer to read. She had “some insights into child abuse,” she informed me, but never went into detail and I did not pursue the subject with her. My research and her editorial comments proved invaluable. As for Charlene, her character is based on a combination of research, personal observations, and direct interaction with teenagers. I rely on firsthand experience. Brainwash and Gadgets are set in New Mexico because I love the state and have traveled extensively throughout the area, and we own a vacation home there. The setting for Genocide is California. I lived in the southern part of the state for over sixteen years. Clonx is set in the Dallas/Fort Worth Metroplex, where I’ve been a resident for more than twenty-five years. I plan to set several novels in certain locations abroad, places I’ve lived in or have visited on many occasions. While online research might be a good place to start when scouting out settings, nothing substitutes for walking in the footsteps of your characters. Google Maps is a great tool, but it covers only the visual. For instance, after I wrote my first draft of Blind Revenge, I spent a week in Palm Springs, California, where the novel is set. I ran the exact route my main character ran every morning. In my first draft of the manuscript, I made no mention of the pungent smell of manure that permeated the desert air as I neared the horse stables that bordered the drainage culvert. Nor did I write about the distant hum of vehicle traffic from the main thoroughfare. Some things Google just can’t capture. While doing scientific research for a particular thriller, I am not only delving into one specific topic but am also constantly on the lookout for the next technological advancement that will appear in the book. So my research efforts are ongoing. I read a lot of nonfiction, most technical in nature, subscribe to several science magazines, conduct extensive online searches, interview experts on the technical subject matter I have chosen for a book, and I draw upon personal experience, as I did in Gadgets. While working for CooperVision Surgical, an ophthalmic company, I held the position of product manager for their laser line. I learned to shoot at a fairly young age and was taught, early on, about the responsibility and safety issues of gun ownership. But writers who aren’t inclined to own a firearm should visit a gun store and ask questions, talk to weapons experts, and interview police officers and/or FBI agents. Many writers’ conferences and writers’ workshops host speakers and panel discussions by various law enforcement agencies. Attend those courses and ask questions. Another resource is The Writer’s Guide to Weapons, by Benjamin Sobieck. 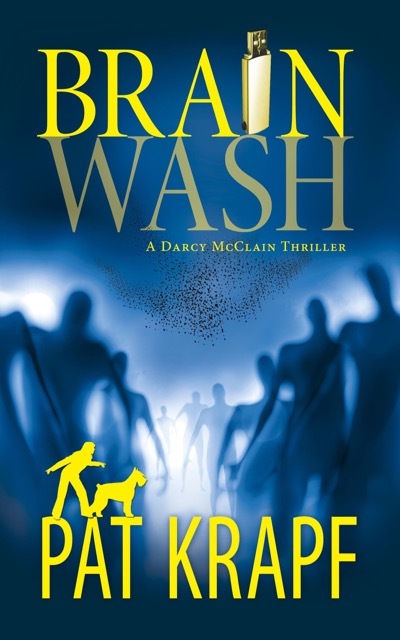 In Brainwash, Darcy and Ed Clark, a forensic scientist, investigate a crime scene in an arroyo (a steep-sided gully cut by running water in an arid or semiarid region) on Darcy’s land in Taos. 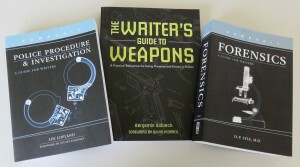 As a starting point, I read Forensics: A Guide for Writers by D.P. Lyle, M.D., as well as Police Procedure & Investigations: A Guide for Writers by Lee Lofland. Both books are part of a Howdunit Series published by Writer’s Digest Books. Another good source was sitting in on panel discussions and listening to qualified speakers at writers’ conventions who gave workshops and talks on CSI work. Fascinated by the topic, I spent months researching anything CSI related, most of the information gleaned from material I found online or from books I had purchased on the subject. Only then was I ready to break down the information that applied to the scenes in Brainwash. As for types of crime scene searches, I researched overlapping zone searches, strip searches, spiral searches, and grid searches. I opted for a grid search as the most thorough technique for hunting for evidence in the arroyo. I did some in-depth reading on lifting shoe prints, dusting for fingerprints, collecting evidence, and how best to protect that evidence from contamination until it could be analyzed by a test laboratory. Because I anticipate that Darcy will be involved in future CSI work, my research is ongoing. Another valuable site has been the American Academy of Forensic Sciences, and last month I read Marilyn T. Miller’s book, Crime Scene Investigation Laboratory Manual. Ms. Miller is a former crime scene investigator and forensic scientist. And lately, I finished digesting the Texas Law Enforcement Explorer Training Guide. In closing, true firsthand knowledge can’t be beat, but acquiring it isn’t always practical, and today via certain social media sites and other online resources, there is a wealth of information at your disposal. All you have to do is seek it out. I plan to devote several blogs to a glossary. I will give a detailed description of each term and include a photo for easy identification. I also plan to do a series of photo blogs showing the exact locations I chose for scenes in my novels, such as the Brainwash crime scene in the arroyo on Darcy’s land in Taos. Until then, Happy New Year and best wishes for 2016! This entry was posted in Writing and tagged Author Pat Krapf, Best new thriller, best new thriller novel, bestselling thrillers, Darcy McClain, Darcy McClain series, Darcy McClain Thriller, Darcy McClain Thriller Series, Pat Krapf Author, Pat Krapf Texas fiction author, Techno-thriller, Techno-thriller author Pat Krapf on December 31, 2015 by Pat Krapf.